Harrisburg Winter [H1881] - $8.00 : Yarn Tree, Your wholesale source for cross stitch supplies. Cross stitch pattern by Foxwood Crossings. 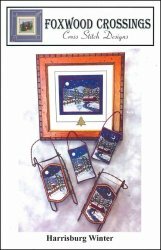 Two sled ornaments and two picture ornaments each featuring a red barn or house accented by snow and pine trees. Stitch counts: Picture 51 x 56 and Ornaments 29 x 51.